The bike in a suitcase was delivered by taxi to the hotel in Hania that three centuries ago was the French embassy, and is now part of the delightful pedestrianised old town and harbour. My room was 5 metres high with nine separate windows. The building had lots of stairs, charm, no lift and provided lots of exercise. Hania was an ancient port and on our first day we wandered round the narrow pedestrian lanes between the picturesque painted blue, white or pink houses and shops that filled their sites. The houses had no gardens and no rear windows and so ancient ladies sat outside the front doors of their ancient houses. 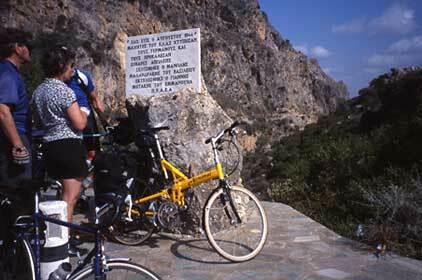 In the afternoon we cycled east along a path overlooking the blue Mediterranean and with the pink cliffs above us. This idyllic track was used for tipping rubbish from above, and so we had to return. By following the map that was an approximation of reality Richard led us back to Hania through the NATO port of Souda. We did not take any photographs. 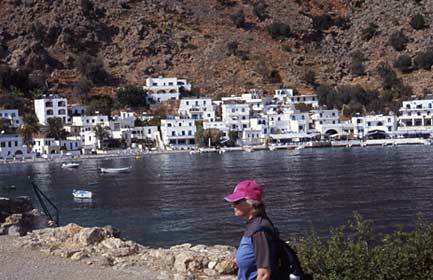 The next day the party of eight loaded our panniers and travelled west to Kissamos. In order to keep the bike light in weight the tyres were 1” Panracer Pasela with a Kevlar belt, and the saddle a Flite Titan that looked a little like a length of broom handle. Arthur was the mechanic of the group and adjusted the derailleur gears, the height, reach and angle of the saddle. Although looking a like a fashion accessory I was pleased to find the bike was normal to ride. 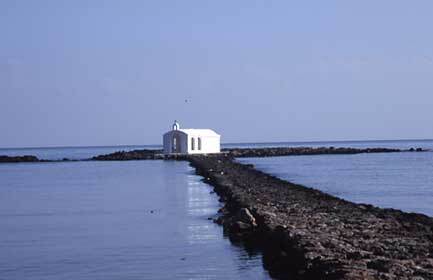 At Kissamos I had an enormous room overlooking the sea only to find the down side was the continuous roar of the waves. Edwin arrived at Kissamos and immediately found a mountain for us to climb. It was Jan’s first mountain climb on a bike and was celebrated with photographs and I am sure she regretted not having an ice axe and Union Jack. She soon experienced many more mountains including the following day when we went to Palaeochora on the south coast. As it was over two thousand feet high Jan counted this as two mountains! This was the first day carrying the panniers on hairpin bends. Even though the rear sprockets on the Airnimal had been changed to mountain bike gearing they were noticeably higher geared than Alan’s bike. As my strength was noticeably lower, I had to walk round the right hand bends. Although Liz was suffering with a repairing broken shoulder she was well ahead but occasionally dropped back to chat with Alan, just emphasising my lack of strength. The water bottle behind the saddle was too difficult to use when I was cycling, however, I had plenty of time to use it on the hairpin bends. Generally I found the food in Crete to be horrendous – lots of it but boring. We went to a restaurant on the beach at Kissamos where most of us, including the waiter, were completely muddled by the order. Richard was very clear as he had five starters and two main courses, but Avril had none. The next evening we all had the same menu of “pheeesh” and the family of three cooked and served several courses to over sixty people, this time without a hitch or panic. Most of the starters were Greek salads with a dressing consisting of a piece of cheese, and many of the main courses were like flavourless bread pudding. The exception was a fish restaurant at Palaeochora where we selected our fish and next saw it filleted on a plate. The price was based on its weight. I think we also paid for the hook, line and sinker, but we did have a complimentary drink to dull the brain so at the time we did not notice. 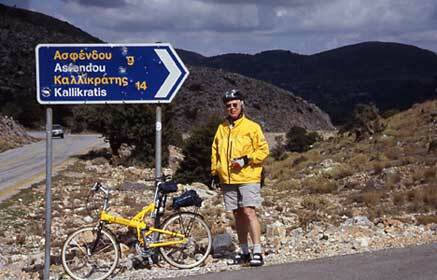 Richard and I cycled along the “other” road from Palaeochora. It was a flat unmade track between plastic greenhouses. The thin wheels did not buckle nor puncture! Richard started to have withdrawal symptoms from the lack of a hill and decided to go inland and upwards. Having reached the top of the mountain on a wide well surfaced unused road we took a secondary road that was a very narrow tarmac finished goat track so steep and twisting that a car driver gave up travelling in the opposite direction even though it was classed as a road. We spent a few days off the bikes walking and generally being tourists in villages that could only be visited by sea. 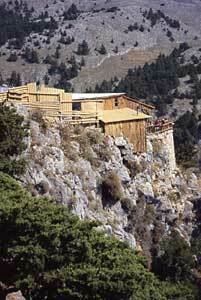 We walked the rocky path of the Samaria Gorge between 300 metre cliffs and 3 metres wide gap. There was an ambulance ready in case of a twisted ankle or worse. It had no siren or lights but it did have four legs and a tail. We were at the end of the season and at Louto they were removing the wooden terrace over the sea while we were still on it having coffee. 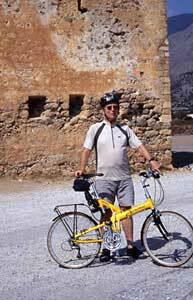 We travelled to Hora Stakion by boat and then cycled to the ancient Venetian castle of Frangokastello. From the covered café terrace we could see the yellow beaches, the blue Libyan sea, and the yellow ochre render on the castle contrasting with the blue gray of the high mountains in the distance - the ones that we had to climb the next day on the route to Georgioupolis. Having noted the height of the road Alan decided to take a taxi from Hora Stakion to Georgioupolis, and he kindly took our panniers. We were sorry he did not feel fit but very pleased he took the luggage as we climbed the 1,000 metres of the White Mountains. By this time Lyn also considered this was three mountains with one peak! As we climbed the mountain we spoke to many of the fifty or so German cyclists who were taken by bus to the top of the mountain in order to cycle down! All of them completely ignored all of us. At Georgioupolis we obtained a Greek baklava cake that Richard precariously balanced on his pannier rack. We celebrated Avril’s birthday by her blowing out the candles shaped as numbers. Lyn finally lost the battle with the food. Although unwell she whizzed ahead when we went over the mountains, but had to take a taxi the next day on the last ride. The drivers in Crete seemed to respect the cyclists but the locals drove with only one hand as the other held their mobiles to their ear. They drove round the hair pin bends with one hand whether they were driving a coach or a car and whether an automatic or manual gears. The fear of going into a Crete jail made the visitors very respectful of cyclists. Edwin did a marvellous job of organising every thing including the birthday cake, but was not so good at organising himself. He lost his passport, missed the plane, had a wasp sting on his lip that Arthur said made him look like Satchmo, and so when he caught a cold we decided he should have the single room just in case he had bird flu. We flew back to Gatwick and as I lifted the bike in a suitcase off the carousel onto a trolley a lady thanked me for helping her. I had the wrong case! The Airnimal was light, and once the Halloween saddle had been adjusted, surprisingly comfortable. The elastomer suspension certainly took out the road bumps from the saddle and this was confirmed by the rattling of the fittings of the panniers on the rack fitted to the un-suspended part of the frame. The straight handlebars were not a problem but I did keep repositioning my hands to avoid tingling in my wrists. The Speedplay frog pedals were transferred from my Cannondale. Since the trip, MSG Bikes in Lancing has fitted a smaller chain wheel and a water bottle to the handlebars and so my “bike in a suitcase” is ready for the next foreign trip. I wish the rider was ready! The author adds: "Peter Wilson cycles with the West Sussex CTC. He has an irregular pulse that makes him a very weak cyclist".